Have you ever tried pesto gouda or gouda recipes that use pesto sauce? If not, try one of these awesome recipes that are simply to die for! Gouda and pesto blend together so well. The creamy, mild Gouda and the freshness of pesto just seem made for each other! If you have never tried the two together, here are a few recipes to get you started. Some feature fresh, homemade pesto with creamy Gouda added while another features Dofino Gouda with Pesto, one of my favorite types of cheese that actually has pesto blended in. This quesadilla is absolutely fantastic! It's made with finely shredded smoked Gouda, store-bought basil pesto sauce, chicken and tortillas and it goes together really quickly. I like to eat it with tortilla chips and salsa on the side, although it's really a meal in itself. It's also great for introducing new flavors to your kids. This recipe makes one quesadilla so be sure to double or triple it, depending on how many you're serving. Give it a try, I'm sure you'll love it! 1. Slice chicken breast into thin strips, season with salt and pepper and cook in a skillet over medium-high heat until cooked through. 2. Meanwhile, shred Gouda cheese carefully. You can adjust the amount of cheese you use as well. 3. Place tortilla in a skillet over medium-high heat and allow it to brown. Flip when it starts to bubble. 4. Meanwhile, add pesto sauce to chicken and stir to coat. Simmer for two minutes. 5. Add chicken to half of the tortilla and cover with Gouda. Allow the tortilla to cook for one more minute then fold over. Immediately flip so the cheese is on the bottom, then remove from pan and cut into halves. This recipe is simply amazing, plus you can add whatever else you like including roasted red peppers and marinated artichokes. You can also replace the Gouda with Pesto with anything else you like, including regular Gouda or smoked mozzarella. 1. Combine oil, vinegar, garlic and pepper in a large bowl and mix well. Add diced cheese, salami, olives and cherry peppers and toss to coat. 2. Cover and chill for up to eight hours. Add croutons and toss to coat before serving. 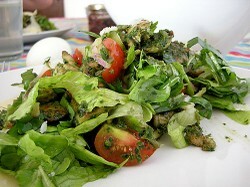 Arrange spinach leaves on plates and top with salad. This panini is really easy to customize, although I think it's absolutely perfect as-is. If you don't have a panini press, just use a grill pan over medium heat and make sure you cover a brick with aluminum to put on top of your sandwich to press it. You can find more great cheese recipes and ideas like this at dofinousa.com if you're interested! 1. Mix together 2 tablespoons of pesto with 1/2 cup mayonnaise and spread onto one half of the ciabatta roll. 2. Lay 4 slices of chicken on each roll and top with bacon. Top this with sliced tomato, fresh spinach and two or three slices of smoked Gouda. 3. Place in a preheated panini grill or grill pan. Cook until cheese is slightly melted and bread is well toasted. Serve immediately.